As a teacher, I try to find ways to incorporate personal finance instruction into my lessons. But I don’t just talk the talk. At home with my three children, I also take whatever opportunities I see to make an impression about sound money management. Create a mindset of scarcity that comes with spending your own money rather than the mindset of abundance that comes with spending OPM (other peoples’ money). Teach them to manage slack, which is a period of relative wealth experienced, say, on payday or after an unexpected windfall like from a bonus or a gift. Help them develop comparison shopping strategies by searching for goods online and learning how to use certain comparison shopping apps. Hope they don’t fail but if they do stick to our guns and not bail them out because we want them to experience the consequences of mismanaging money. Our exercise proved a wonderful success. With the prospect of keeping more money for themselves, each child looked for ways to cut costs and do without. Our 9th grader shopped at discounts sites online and bought his new threads at an outlet mall. He got everything he needed—and stuck a cool $150 in his savings account, to be spent on social outings like football games and movies. Our 4th grader met the challenge with an impressive inquiry. “Can I just save it all?” she asked. That gave us a chance to discuss wants and needs. We asked her how she expected to get along without pencils and folders. Ultimately, she bought the supplies she would need but said no thanks to new shoes. The ones she had still had plenty of wear. Our 5th grader was a different story. He too wanted to do without certain necessities, which of course is not the answer. But we learned our own lesson by waiting too long to talk to him. Opening day was upon us. We were short on time and stores were short on supplies. So, he had to make do with whatever we could scrounge from around the house. It turned out we already had just about everything he would need. Our happiest moment? 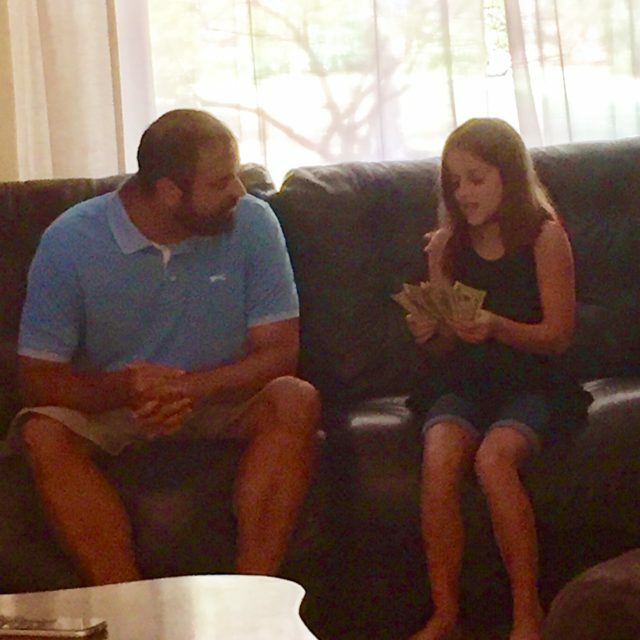 Chloe, our 4th grader, said she wanted to use some her savings to take a friend to the movies. We have long tried to show our kids the value of being generous; it is a kind of spending that brings intrinsic rewards and rightfully comes from its own bucket, which she had funded by doing without those new shoes.